It was through a shared meal that God first spoke to our hearts about helping plant a church in the heart of Pittsburgh. The first time we visited our church, it wasn’t even a church yet. The pastor invited us to share a meal immediately following the service, and the entire congregation could fit around one long conference table. The food was simple, but the intimate community it afforded was not. I still remember what was prepared – potato soup, fat chunks of crunchy bacon, leafy greens, and the best homemade croutons I’ve ever tasted. The individuals weren’t just sharing bread; they were sharing life. Shortly after joining the core group of this new plant, we began to open our small apartment for a weekly Bible study. Sometimes we shared a meal, other times I just served cookies and coffee. On one occasion, I looked around the room at the people who had become our new family. They were sitting on stained carpet, eating from paper plates, and happy as larks! No one complained about the lack of seating or the crayon swirls on the wall. And in that moment, I realized the significance of the scriptural command to practice hospitality. My husband and I entertained at our previous church. We hosted the occasional meal for our pastor. 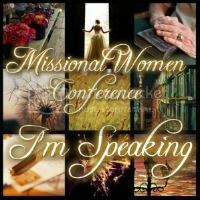 I volunteered my home for a few women’s events. But it wasn’t until I saw the connections between the gospel and the dinner table in our new church plant that I realized what a hospitable heart truly looked like. Hospitality is about having a hospitable heart. It’s about opening your heart to others by opening your home to them. It’s about serving without grumbling. It’s about consistently putting others’ needs before your own. 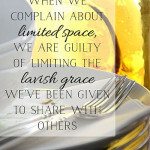 God is still using hospitality to clean out my heart like a packed closet – making room for others and most importantly, for Him! I have 4-yr-old twin BOYS! If you come to my house, I can guarantee you there will be smashed food and dried boogers on something! Honestly, there are times when my front doormat better reads Do Not Disturb rather than Welcome. (I’ll be revisiting this concept on Wednesday). I still fight the temptation to wield hospitality as an excuse to buy those new dishes I saw at Target or the lighting fixture I added to my Pinterest board last week. But hospitality is not about throwing the best parties or crafting the perfect tablescape; it’s a battle for the heart. 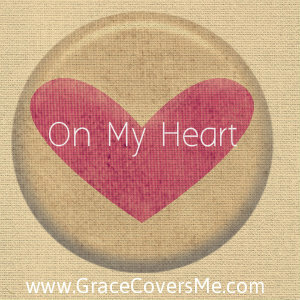 God calls us to open our homes and hearts as a measure of the hospitality he has demonstrated toward us in Christ (Is. 25:6-9; Luke 14:16-24, Rev. 19:9). So, how do you “pursue” hospitality? 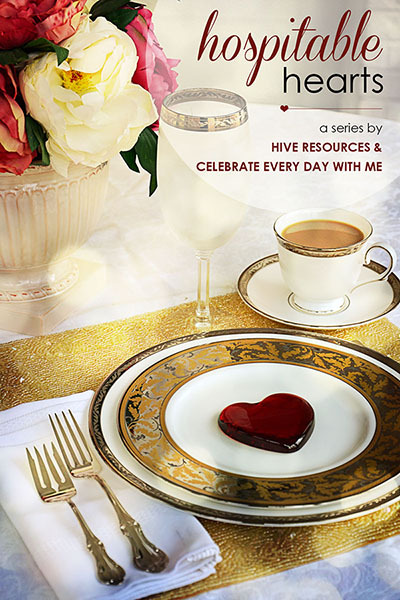 Tomorrow, hospitality guru Kristen Summers of Celebrate Every Day with Me is sharing some of her trade secrets – how you can open your home and heart to others. I hope you’ll join us this week as we look at what Scripture says about hospitality and how you can pursue it! 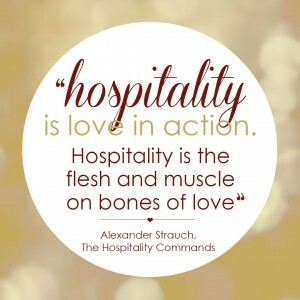 How active is your pursuit of hospitality? If you aren’t pursuing hospitality, what is the biggest obstacle that prevents you from doing so? Alexander Strauch, The Hospitality Commands (Lew & Roth: Littleton, 1993), 427. There are so many battles in our hearts. Hospitality is more about serving others than it is about us. I’m so thankful for God’s love and grace. Love this post! It is just beautiful. The biggest obstacle that prevents me from pursuing hospitality is perfectionism. Thank you for sharing on this subject with such beautiful illustrations that it is not about the condition of our furniture, but the co diction of our heart. Karen – it is such a battle for me! But I’ve found the more I open my home, the easier it becomes to let go of the other things I tend to hold dear! I am looking forward to this week on “The Hive”. 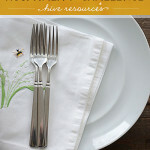 Hospitality is one of my favorite subjects…to study and to practice. God gave us an amazing home and we try to use it often for hospitality to our missions students as well as Ed’s colleagues. My home has many remodeling projects in progress and lots of decorating ideas left undone… But God (my two favorite words) still uses it to bless others. And that makes us happy! Debi – I think you should be writing this series instead of me! Many of the lessons I’ve learned have come from my Mother and You! 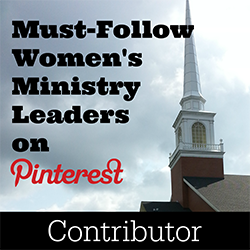 Thankful for your ministry of hospitality and what it means for God’s global glory! Thank you for the wonderful words of inspiration from God! I look forward to future posts! Thanks Julie! I look forward to having you here! Love, love, love! Praying to haves heart open to loving others through my open door. Love this, Melissa! So many wonderful points you made here– sometimes we worry too much about ourselves and not enough about others. I still remember Cindy Bush emphasizing that there is a difference between hospitality and entertaining, with the latter focusing more on impressing others and drawing attention to one’s self. I still find myself horrified when friends appear at the door (as happened this morning!) and I am still not dressed and my boys are standing in what seems like a pool of crumbs! Such a needed balance between striving to make others comfortable (and, therefore, cleaning the crumbs and such) and not focusing too much on this to the point that we lose our focus. Excited to see what else you will share this week and how I can be challenged to open our home in a God-glorifying way! Oh Betsy – I need to write a whole post on ‘spontaneous’ hospitality! And mainly, I’d be writing just to myself! I want to be the kind of host that has frozen scones ready to go for guests who stop by unannounced. I’ve yet to meet that goal! But many of the lessons I’ve learned have come through such visits! This is so great! I battle all the same things you do and I love (and am convicted by) how you point out that hospitality is something to be pursued. Can’t wait to read more this week! I too battle perfection. Love how you bring light to the fact hospitality is a heart issue, just like tithing, services, ect. We are learning so much of what it means to be hospitable to those around us. As we open up our hearts and our homes God is teaching us so much what it means to truly be in community with one another. I look forward to the rest of the week. Blessings to you and Kristen as you share your heart and God’s heart on this important subject. Lori – yes! me too! Entertaining IS exhausting! Usually I’m the most exhausted when I try to do it all myself rather than resting in the people God sends to help me or accepting help from my guests who offer! When I’m completely overwhelmed and exhausted I know I’m not resting in Him! My husband and I both love being able to open up our homes to others, however, I find that as soon as I take my focus off of the reason I am doing it (the glory of God), I can quickly turn from being a joyful servant to an irritated and exausted wife and mom. So my challenge to myself is to pray that Christ truly be my vision when I am going through the process of preparing our home for visitors, or even (and especially!) when I am caught off guard by someones’ spontaneous visit. The biggest obstacle our family faces right now in way of hospitality is my health. Recently, it seemed that the Lord grounded me from the service of hospitality through an onslaught of health issues, but presently, we are slowly getting back to “normal” and hope to begin again very soon. So thank you for your counsel; it will be a great and necessary encouragement as we endeavor to have a servant’s heart! I love the call you are giving to “pursue” hospitality (well, that the Bible gives!). It is definitely something that we have to actively aim to do, otherwise it is way to easy to be self-focused. Thank you Melissa!